Czech Republic | Let's Go for a Trip! Czech Republic is located in Central Europe bordering Poland to the north, Germany to the northwest and west, Austria to the south, and Slovakia to the east. 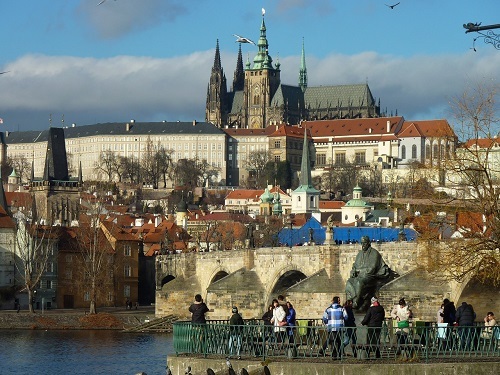 The capital of Czech Republic is Prague which is also the biggest city of Czech Republic and a popular tourist destination. Czech Republic became a member of European Union in May, 2004. Czech Republic was earlier a part of Czechoslovakia which was dissolved in January, 1993 and was split into what is now called Czech and Slovak Republics. Brno, Ostrava, Plzeň, Olomouc, , České Budějovice, Zlín, Hradec Králové, Ústí nad Labem, Pardubice and Karlovy Vary are the other important cities of Czech Republic. Czech Republic is divided into two parts based on geographical and cultural classification. They are Bohemia and Moravia. Bohemian cities and towns are popular for their spas and wine vineyards. It is also home to many castles which are open for visitors. One of the other tourism attractions is the availability of hundreds of miles of marked trails for hiking, cycling and skiing. The population of Czech Republic is roughly 10.5 million and the official language being spoken is Czech. It is located in Central Europe bordering Poland to the north, Germany to the northwest and west, Austria to the south, and Slovakia to the east. It is basically a landlocked country strategically located on some of the most important land routes in Europe. By Air – The national airline of Czech Republic is CSA Czech Airlines. There are many other small and popular international airlines operating from Czech Republic. The major airport is Prague Ruzyne International Airport (PRG). The airport is located approximately 10 miles north west of Prague.